How do its one-year contracts compare with rival offerings? EE - currently the UK's only 4G network provider - has launched Sim-only plans touting one-year contracts for as little as £21 a month. While that does come with unlimited calls and texts, the package's data allowance is capped at 500MB, which could be gobbled stupendously fast on the firm's speedy network - should users be able to tap into the 4G speeds, that is. 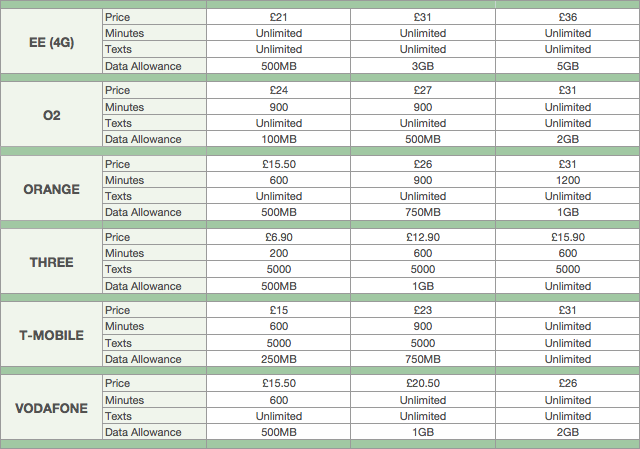 Either way, 5GB of data for a monthly charge of £36 does look tempting, so we thought a comparison table was in order to see just how impressive - or not - those 4G deals really are. Here's a selection of 12-month Sim-only deals from all of the main network providers. It's worth bearing in mind that we've excluded Three's highly-rated The One Plan as it's only available on a rolling monthly contract, which for £25 gets you unlimited data, 2000 minutes and 5000 texts. GiffGaff also touts some tasty one-month bargains for those that wish to avoid an annual obligation. As you can see, EE's 4G deals are commendable. They're certainly better than EE's 24-month handset contracts, revealed last month. But if you're willing to forego 4G, you can have more data from Three, for a lot less money. The cost comes in the form of limited call time and texts, but many SMS messages do you send in a month and how much time do you spend on the phone?